Since the first rumors of an Apple switch to Intel, everyone has been wondering about the potential speed of Intel-based Macs. Last week’s announcement of the first shipping Intel-based Macs brought with it the promise of a major speed boost: Apple’s Web pages suggest that the new iMac, powered by the Intel Core Duo processor, is twice as fast as its G5 predecessor. Macworld Lab’s tests do show that the new Intel-based iMac is faster than the iMac G5 when running native applications. However, we found that those improvements are generally much less than what Apple claims is a 2x improvement in speed. Instead, our tests found the new 2.0GHz Core Duo iMac takes rougly 10 to 25 percent less time than the G5 iMac to perform the same native application tasks, albeit with some notable exceptions. (If you'd prefer, that makes the Core Duo iMac 1.1 to 1.3 times as fast.) And we also found that applications that aren’t yet Intel-native—which must run using Apple’s Rosetta code-translation technology —tend to run half as fast as the same applications running natively on the iMac G5. Apple’s much-publicized test scores for the new iMac were made with programs designed specifically to generate test results. So they may give some indication of the overall performance potential of these systems. However, such test results often don’t match up to what regular users see in their everyday work—i.e., the speed of real-world applications. In tests with two iLife ’06 applications—iMovie and iPhoto —we found remarkably different performance depending on what features of the programs we tried. For example, the act of applying one iMovie effect to a video clip resulted in a remarkable speed improvement of 1.8 times. But a different effect showed only half the improvement, and yet another showed no speed improvement at all. Similarly, importing 100 photos into iPhoto 6 took 35 percent less time on the Intel-based iMac, and exporting from iPhoto to a QuickTime movie took 25 percent less time. But exporting iPhoto images to a Web page took only 8 percent less time. And exporting those images to files actually took 9 percent more time on the Intel-based Macs. Bare Bones Software’s BBEdit performed well on the new systems. In our BBEdit test battery, which performed five operations (Process Lines Containing, two Replace All grep searches, Process Duplicate Lines, and Sort Lines) on a 75.1 MB text file, the Intel-based iMac took 21 percent less time than the G5. 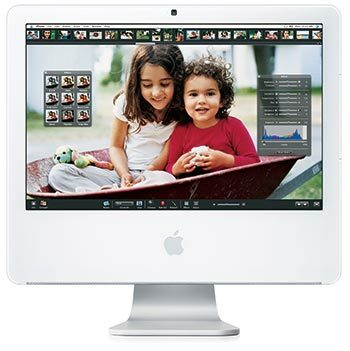 Other tests—creating a Zip archive in the Finder, encoding an audio file in iTunes, and generating a DVD image (including all required MPEG-2 rendering) in iDVD —resulted in the most common range of speed improvements, taking between 11 and 12 percent less time on the Intel-based iMac than on the G5. These new iMacs are the first Mac systems to use the new Extensible Firmware Interface system for booting, and that may be one of the contributing factors to excellent start-up times for these systems. The Intel-based iMac booted in 25 seconds, almost half the time it took the iMac G5. One application, however, constantly disappointed us during our testing: iMovie 6. Not only was this brand-new version of Apple’s video-editing application equally buggy on both platforms, but it was dramatically slower at compressing and exporting video on the Intel-based system than on the G5—so much so that we suspect iMovie’s poor performance is the result of a bug within iMovie rather than any intrinsic failure of the iMac.